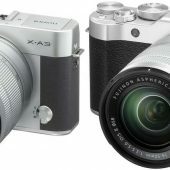 Adorama has the Fujifilm X-A3 for $349.00 (Now only $299) with 16-50mm OIS II Lens. This is a very affordable price fora capable APS-C camera so don’t miss out. Also, Lexar 1000X cards are still on sale 128GB, 64GB, or 32GB.